LUME is thrilled to announce an Entropi/Sloth Racket double bill at Kings Place on 13th March. It’s part of the Venus Unwrapped series, which throws a spotlight on female composers and is a great opportunity for LUME co-founders Cath Roberts and Dee Byrne to showcase their projects in such an amazing venue. This performance at Kings Place marks the start of exciting LUME plans in the pipeline for later on this year. Cath and Dee have spent 2018 concentrating on their own musical projects and are pleased to share the stage with their bands for this special occasion! Cath’s band Sloth Racket will be coming fresh from a recording of their next album, to be released on Luminous in September. Dee’s band Entropi will perform a few recently penned compositions as well as material from their previous albums. 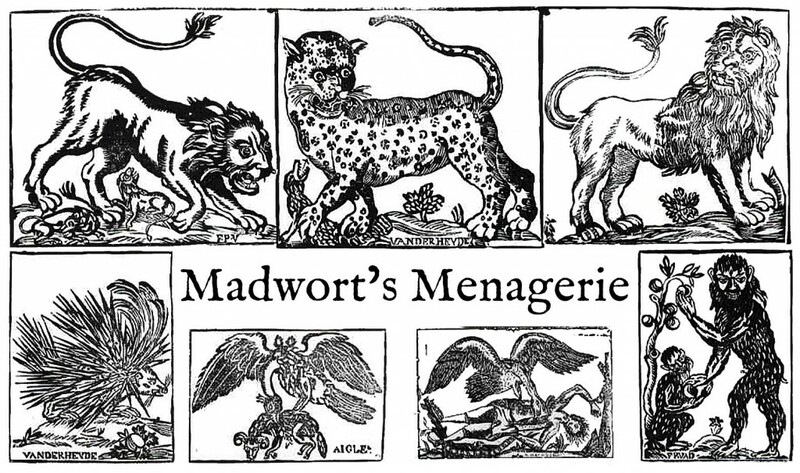 Grab your tickets to this one-off event! 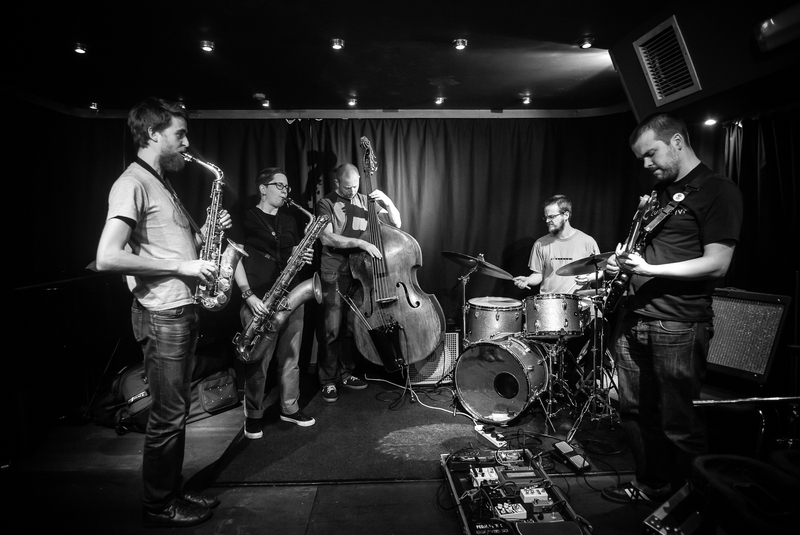 Sloth Racket is a band of UK improvisers led by baritone saxophonist Cath Roberts, with Sam Andreae on alto saxophone, Anton Hunter on guitar, Seth Bennett on bass and Johnny Hunter on drums. They play Cath’s compositions, combining written fragments with graphic notation to explore the balance between freedom and structure. The results are always different, and so far have ranged across musical territories taking in fiery free jazz, minimal improv textures and heavy riffs. The band formed in 2015 when Jazz North East invited Cath to present a new project at Gateshead International Jazz Festival. Everyone agreed this had to be more than just a one-off, and they went on to appear at London Jazz Festival, Brighton Alternative Jazz Festival and LUME Festival, as well as doing four UK tours so far. Sloth Racket’s third studio album A Glorious Monster is out on the Luminous label. 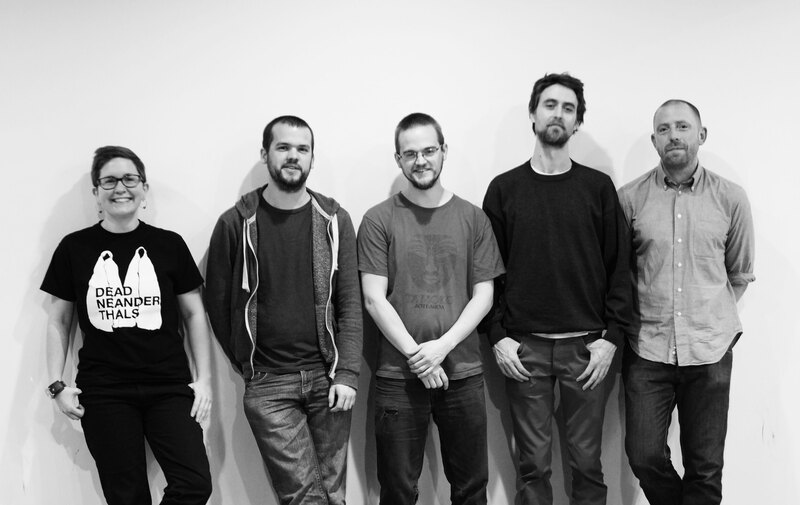 Entropi has been steadily developing its own dynamic band sound since its beginnings in 2010. Placing a high importance on improvisation, Dee Byrne’s compositions allow breathing space for depth of communication and interaction between the band members. Juggling order and chaos, composition and improvisation, the group takes listeners on a journey with compelling group interplay, strong themes, open-ended improvisation, dark grooves and interweaving melodic textures. 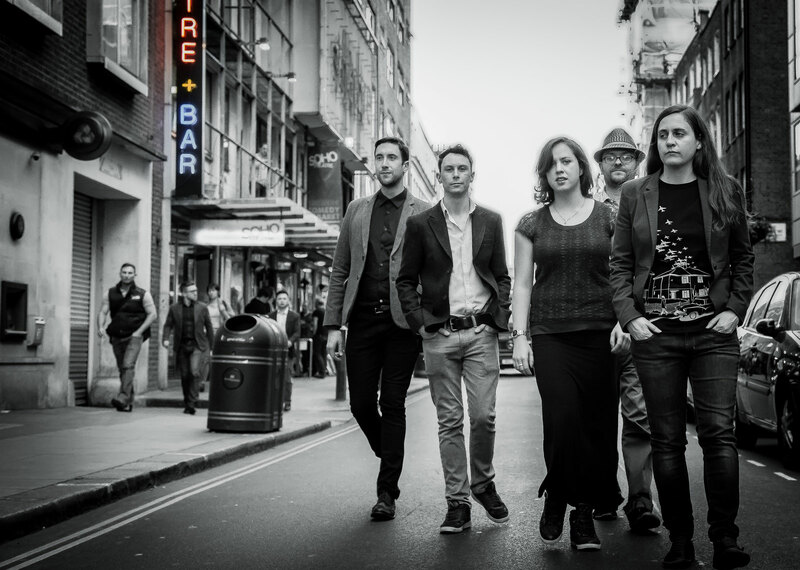 The ensemble comprises bandleader and alto saxophonist Dee Byrne, trumpeter Andre Canniere, keyboardist Rebecca Nash, drummer Matt Fisher and bassist Olie Brice. Having performed live together for some time, the band has achieved a striking empathy and freedom to take risks. 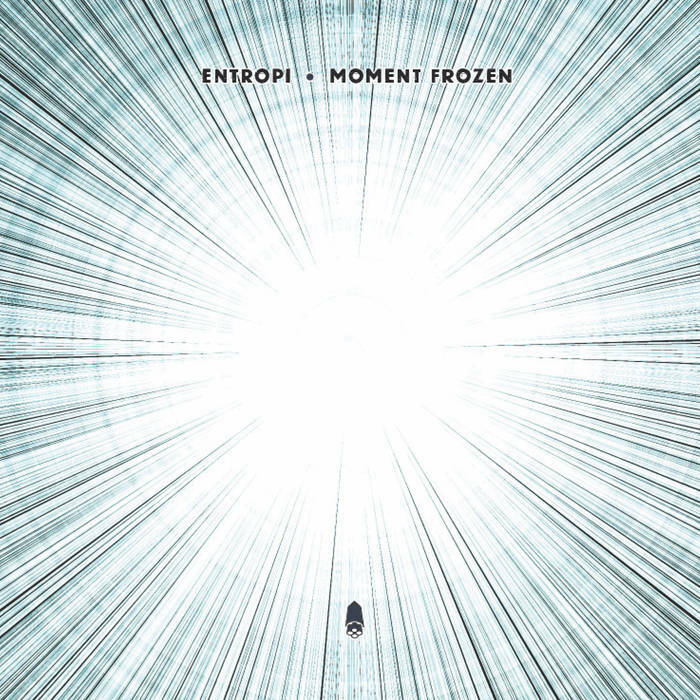 Entropi’s second album Moment Frozen was released on Whirlwind Recordings in September 2017. Their performance at Marsden Jazz Festival in October 2018 was broadcast on Radio 3’s Jazz Now programme on Christmas Eve. This entry was posted in a year seems to have passed, Announcements, back in the game, cutting loose, double bill, entropi, improv, joy, kings place, new compositions!, new tunes, only Eb saxes yeah, saxes, sloth racket, sloths, space jazz, venus unwrapped, you know what time it is on January 21, 2019 by deebyrne. The eagerly-anticipated second album from Entropi, Moment Frozen, is released this month on Whirlwind Recordings. To celebrate the release, Dee is taking the band on a UK tour including a special album release show at Kings Place on Friday 29th September. It promises to be a lovely evening and a great chance to hear the band playing their new album on home turf. Tickets are moving fast, so we advise getting yours as soon as you can: they’re available from the Kings Place website. This gig will be something of a LUME social, so we’d love it if you can join us. Make sure you’re part of it by buying your tickets now! While Dee is releasing and touring a new album this month, Cath is in the midst of the production of her own. 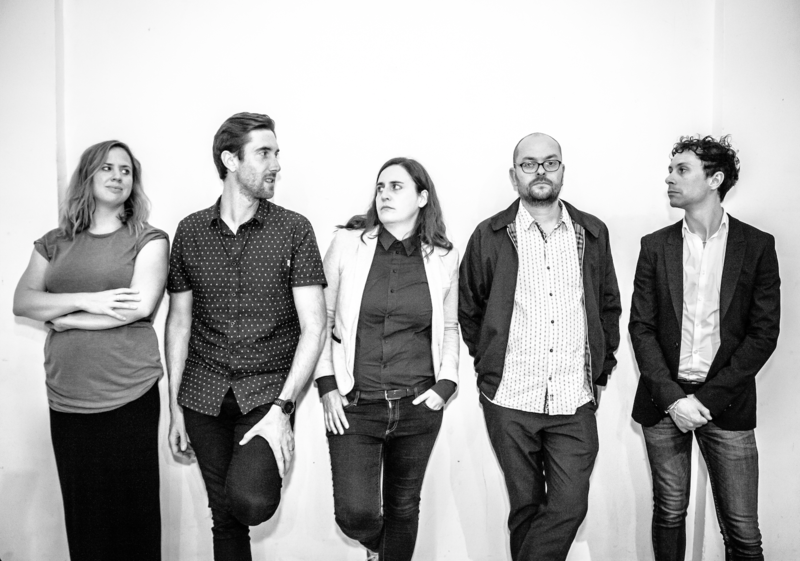 Favourite Animals, the ten piece group originally formed for Cath’s residency at Lancaster Jazz Festival last year, went into the studio this August with Alex Bonney. 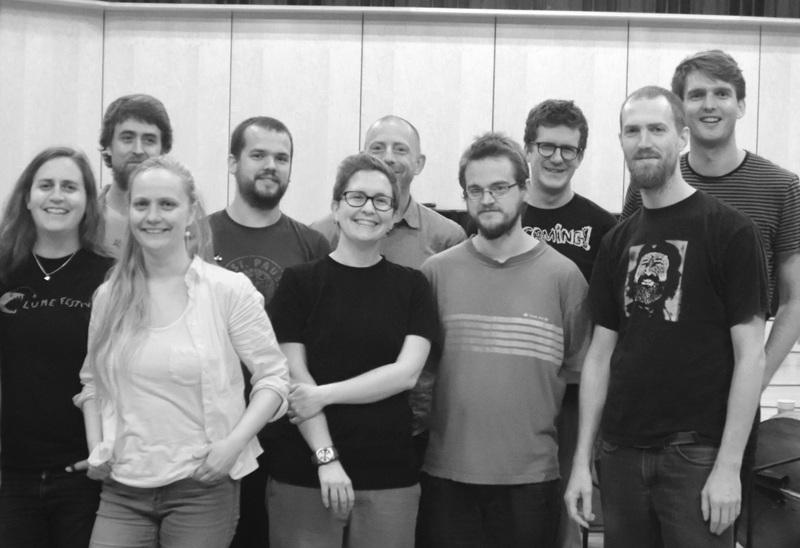 They spent three days working at City, Uinversity of London – thanks to trombonist Tullis Rennie who works as a lecturer there – and recorded new versions of all the music from the Lancaster commission. This entry was posted in album launch!, BARITONE, bass, bass clarinets, Bonney engineering in the house, CDs!, clarinets, drums, flutes, grooves, guitars, joy, let's raise a fat wedge of cash, Luminous Label!, lungs, magic, massive lineup, new compositions!, News, northern friends!, overcrowding, pandemonium, Quite a few flutes!, Records!, saxes, sloths, space jazz, trombones, trumpets, Yeah, you know what time it is on September 11, 2017 by cath. 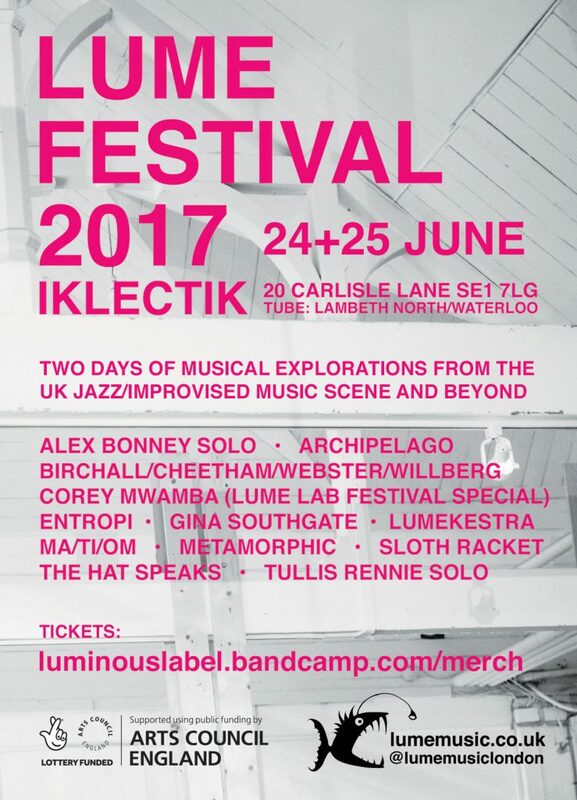 The second LUME Festival is taking place at IKLECTIK on the weekend of 24th/25th June. This year’s event will be a two-dayer, with a host of LUME’s favourite artists on the bill. Join us for two days of spontaneous musical explorations, collaborations old and new, live painting from Gina Southgate and all round good times! Buy your tickets now from the Luminous Bandcamp site. This entry was posted in A freakin FESTIVAL!, a year seems to have passed, an actual real piano, BARITONE, bass, bass clarinets, clarinets, cutting loose, dice-throwing, drums, electronics, fish gets experimental, flutes, grooves, guitars, HAT, IKLECTIK, improv, joy, keyboardfest, last gig of the season!, LUME Lab, LUMEkestra, Luminous Label!, lungs, magic, massive lineup, new compositions!, northern friends!, Norwegian friends!, nuts, overcrowding, pandemonium, party!, randomness, saxes, sloths, space fish, space jazz, trombones, trumpets, vibes, Yeah on May 25, 2017 by cath. 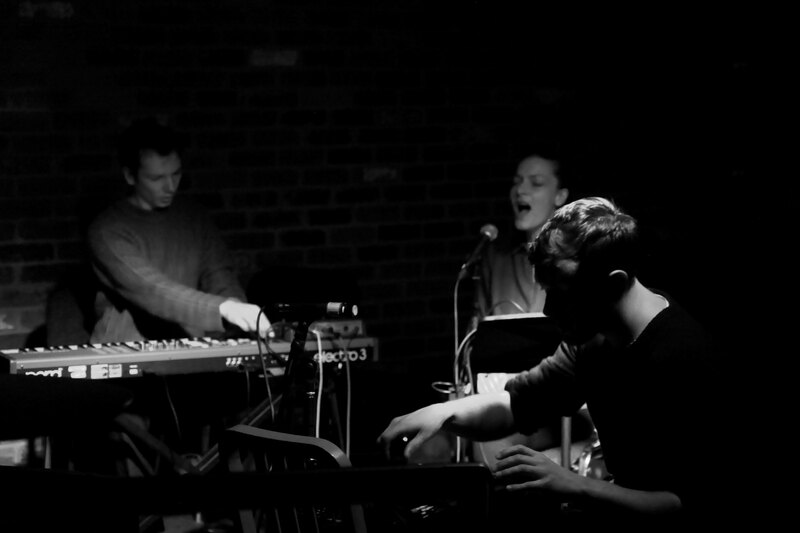 Quick post to share Dan Paton’s photo of the LUMEkestra in action last night at IKLECTIK. It was a fantastic night: the venue was packed out, good times were had and new music was made. There will be more…..see you next time! This entry was posted in accordion in the house, an actual real piano, BARITONE, bass, bass clarinets, beats, birds, bleep!, clarinets, did we really just do that, electronics, fish gets experimental, flutes, grooves, guitars, improv, joy, keyboardfest, LJF, LUMEkestra, lungs, magic, many guitars, massive lineup, new compositions!, northern friends!, nuts, overcrowding, pandemonium, party!, Quite a few flutes!, randomness, saxes, sloths, thanks for a great year everyone, trombones, trumpets, two drummers!, vibes, Yeah on November 15, 2016 by cath. 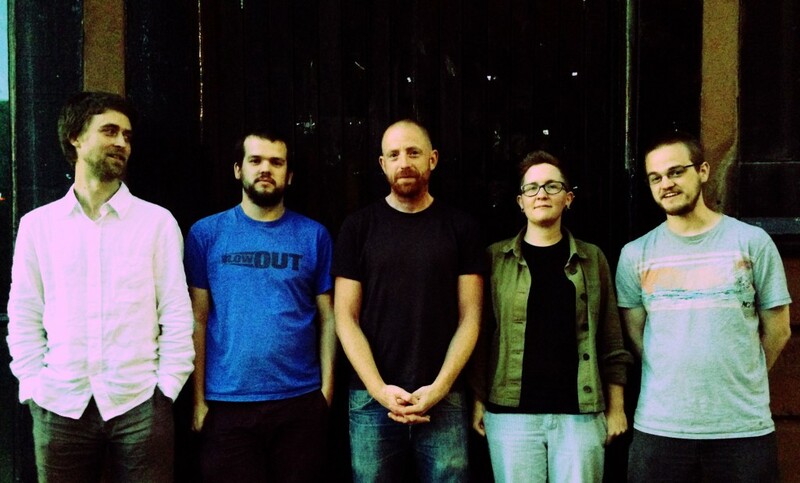 A double bill of touring bands this month, as Cath Roberts launches her Sloth Racket album ‘Triptych’ and Andrew Woodhead brings his improvising trio ELDA from Birmingham. Sloth Racket is a quintet of UK improvisers led by baritone saxophonist Cath Roberts, with Anton Hunter (Beats & Pieces Big Band, Article XI) on guitar, Sam Andreae (Trio Riot, Silence Blossoms) on tenor saxophone, Seth Bennett (Metamorphic, En Bas Quartet) on bass and Johnny Hunter (Nat Birchall, Johnny Hunter Quartet) on drums. 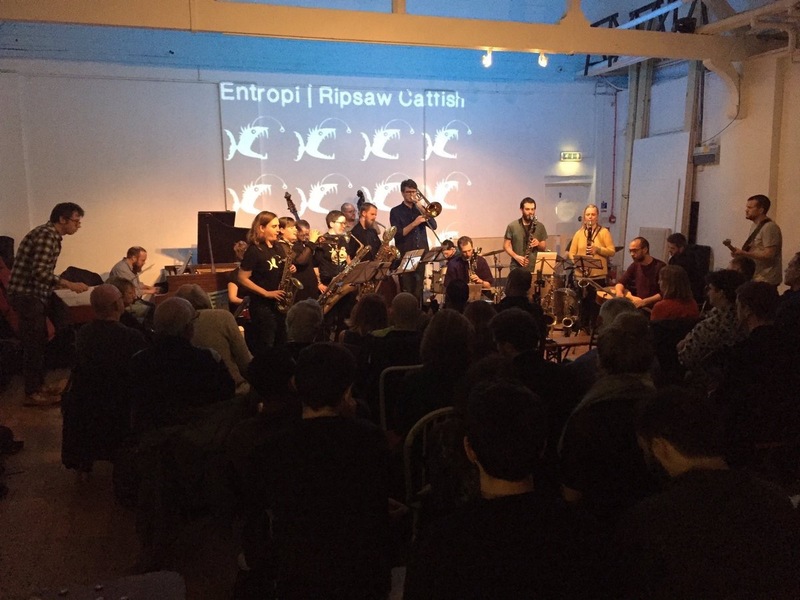 The group play Cath’s compositions, in the form of frameworks for improvisation: combining composed fragments with graphic notation to explore the balance between freedom and structure. In November 2015 they gathered to record at Limefield Studio in Manchester with John Ellis (Cinematic Orchestra) engineering. The resulting session, on a cold and rainy evening fuelled by coffee and pizza, produced three substantial tracks that range across musical territories from fiery free jazz, to minimal improv textures, to deep grooves. The album ‘Triptych’ is released in May 2016 on the Luminous label. Andrew Woodhead’s latest project ELDA is a collaboration with Norwegian vocalist Kari Eskild Havenstrøm (Trondheim Voices, Kristoffer Lo) and trumpeter Aaron Diaz (The Destroyers, Sid Peacock), mixing acoustic sounds with live electronics and soundscapes. 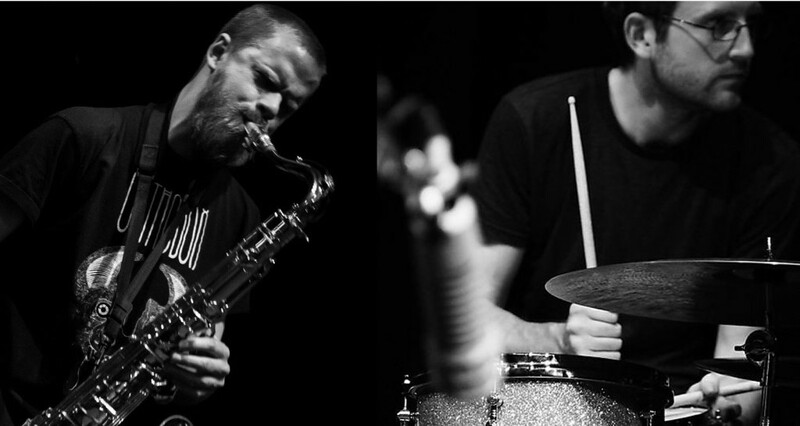 Andrew and Kari met on a musical exchange between Trondheim and Birmingham at the 2013 Cheltenham Jazz Festival, and formed this trio with Aaron to continue their collaboration and explore their shared musical interests. This entry was posted in album launch!, BARITONE, bass, CDs!, drums, electronics, grooves, guitars, improv, joy, keyboardfest, Luminous Label!, magic, northern friends!, Norwegian friends!, party!, randomness, saxes, sloths, space fish, trumpets, vocals, Vortex!, Yeah on April 17, 2016 by cath.